Transplanting in the fall makes for a lovelier spring garden. It's a good idea to know how to transplant divided plants and flowers in the fall so that your garden will have a great new look come springtime. With the cooler weather in the fall, there's less stress on your plants, making it a perfect time for transplanting. Different plants have different growing seasons, so not all of them are candidates for dividing and transplanting in the fall. Plants that bloom in the spring are the best candidates for division and transplanting in the fall, while those that bloom in the late summer or fall should be divided in the spring. The key is to divide and move plants when they are rather dormant to reduce shock to the plant's system. Once you've decided which plants in your garden are the best candidates for transplanting, the next step of how to transplant divided plants and flowers in the fall is the actual division of the plants. For most plants, division is not that difficult. Here are some quick tips on how to divide different kinds of plants. 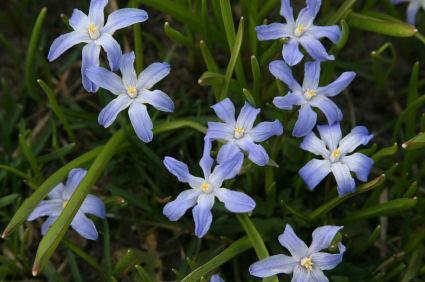 Irises and some other plants grow from rhizomes, which are like bulbs but they grow horizontally along the ground. To divide rhizomes, just dig them up and rinse off any excess dirt. Break or cut the rhizomes apart. If there's still any greenery on the rhizomes, make sure each one has one or two stems when you divide them. Then just trim back the foliage and replant. The process is similar when you're looking at dividing other bulbs. If you have a big clump of bulbs, you can gently dig it out and then just pull the individual bulbs apart. Discard any soft, damaged or dried out bulbs and replant the healthy ones immediately. Lily bulbs have outer scales that can be removed and replanted individually. For plants that aren't bulbs that you want to divide, simply dig up the whole plant and use a shovel or pitchfork to gently divide the root systems. Then just replant them and water well to help establish the new plants. If you're trying to grow a new shrub or plant that has a woody stem, instead of digging up the plant just cut off a section of the existing plant that has three or four divisions of leaf nodes. Remove the bottom leaves so that the bottom two leaf nodes are clear of leaves. This is where new roots will grow. Dip the end of the stem in rooting solution, then plant it in a container filled with vermiculite or perlite. Cover it with a plastic bag, making a sort of greenhouse to help keep moisture in. After about a month, give the plant a gentle tug. If you feel resistance, you've got roots and it's time to transplant. When determining how to transplant divided flowers and plants in the fall, replant them in the same manner you planted the bulbs or plants when you first put them in your garden. Consider light levels, the condition of the soil and how much water the plants will need, just like you would have done with the original plants. It's a great idea to keep plants in the same bed or in a bed that's similar to the one the plants came from to ensure continued success. It's also a great idea to transplant on a somewhat cool and cloudy day, as this will put less stress on the plants. Always plant bulbs to the recommended depth so they won't freeze over the winter, and water plants after they have been transplanted so they will be happier in their new home.